This promise was, of course, dependent upon Catholics taking the oath of loyalty to King William and Queen Mary within the first year of their realm. At first glance this would seem reasonable as William had conducted his campaign in Ireland with the blessings of his ally, the Pope. In 1693 however, Papal support switched to King James ll, who was in exile in France. This caused King William to become less tolerant and for Irish Catholics to be less willing to take a loyalty oath. This is highlighted by a bill put forward in the Irish Parliament in 1695 and passed in 1697, outlawing Catholic clergy. Also, in Ireland, the now totally Protestant parliament, was more inclined to impose much harsher punishments upon Catholics and Dissenters and following the death of William in 1702 (Mary died in 1695) they took the opportunity to increase the restrictions against Catholics holding office or land. In this they were supported by the British Parliament and Queen Anne ll the Protestant daughter of James ll and sister in law of William. She was the last of the Stuart monarchs to sit on the British throne. Exclusion of Catholics from holding public office such as Judge MP solicitor Jurist or barrister, civil servant, sheriff, or town councillor. A ban was imposed upon Catholics from owning land. Catholics could not lease land for longer than thirty one years and the rent was to equal two thirds of the yearly value of the land. A ban imposed upon intermarriage between Catholics and Protestants. Catholic could not be an orphan’s guardian. No cleric could wear distinguishing clothes. The introduction of the Penal Laws in Ireland would have a serious impact on Irish society and dive Ireland into deeper poverty for years to come. 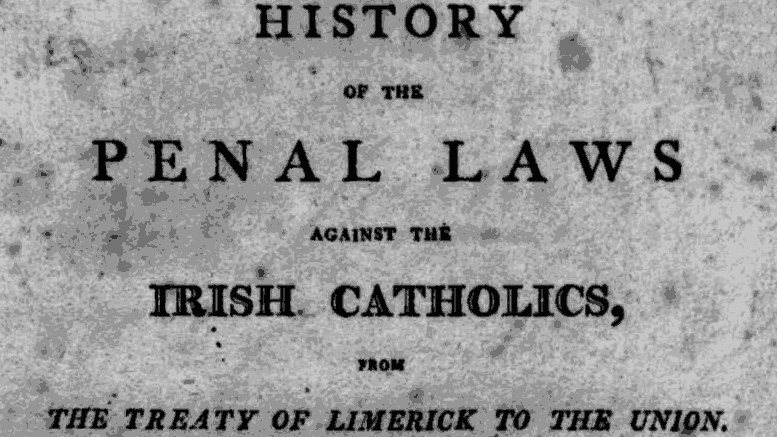 As 18th century progressed, the anti-Catholic penal laws were strengthened and had a profound effect upon all aspects of Irish society. The great Gaelic lords were gone and the clans beaten and subdued. The Catholic Old English were totally excluded from all the upper positions of social and political life. Except for a few Presbyterian members, the Parliament was Church of Ireland (Anglican). The House of Lords in it’s entirety was composed of the Anglican hierarchy and nobility. This became known as the Protestant Ascendancy, a name first used in 1782. They were to become an extremely wealthy and elite class of people who owned most of the property of Ireland. A few Catholic families had managed to hold onto their lands but as the century progressed many converted to Protestantism to protect their interests. By the time Queen Anne died in 1714, Catholic ownership of land had fallen to 14% of the total. In 1780 that percentage reached as low as 5%. The percentage of Catholic in the population terms was 75%. It is interesting to note that one Catholic who had turned Protestant was to become the wealthiest man in Ireland. He was William Connelly the son of a Donegal innkeeper and a lawyer who dealt in buying confiscated lands. As Britain started to expand its empire abroad the Ascendancy class invested heavily in Dublin turning it into the second city of the empire after London. Many new impressive buildings were constructed. Broad thoroughfares were laid down and beautiful parks also established. Large and impressive houses were built on estates throughout the country. Life was extremely good to them. As for the Catholics, and increasingly, the non-conforming sects such as the Presbyterian’s, life was pleasant. By refusing to take the Eucharist test of 1704, the dissenting Protestants were excluded from any major role in the governance or wealth of the country. Although they had fought in the Cromwellian and Williamite wars against the Catholics they were now cobbled to them in their misfortune as victims of the penal laws.